5 Projects Done With A WaterJet Cutter | Antech Technologies Inc.
We don’t mean to be too “out there” by saying that waterjet is the future of cutting, but – given the vast array of possibilities to cut with a waterjet, it’s evident a waterjet cutter is a fantastic cutting option to have around. By forcing high-pressure water through a tiny orifice, a waterjet cutter can cut virtually any material. These machines are incredibly versatile and can cut through wood, metal, glass as well as a variety of other, less conventional materials. Waterjets are environmentally friendly, they deliver accurate cuts and perform faster than many other traditional cutting tools. The highest security form of protection for many institutions, high-secure homes, and organizations such as banks and public vaults (and a defining feature of many action movies), bullet-proof glass is secure enough to protect you from a firearm but not from a waterjet! You won’t believe it? Check it out! Cutting geodes is a complicated process because they are easily damaged if not cut properly. The beautiful gem inside is often scuffed when poorly handled, leading to abrasions and poor results. But, a waterjet is a solutionto a smooth, clean and precise geode cutting! Using a waterjet to cut geode you’ll be getting a perfectly smooth cut, great for geodes displayed in stores, museums, and homes. 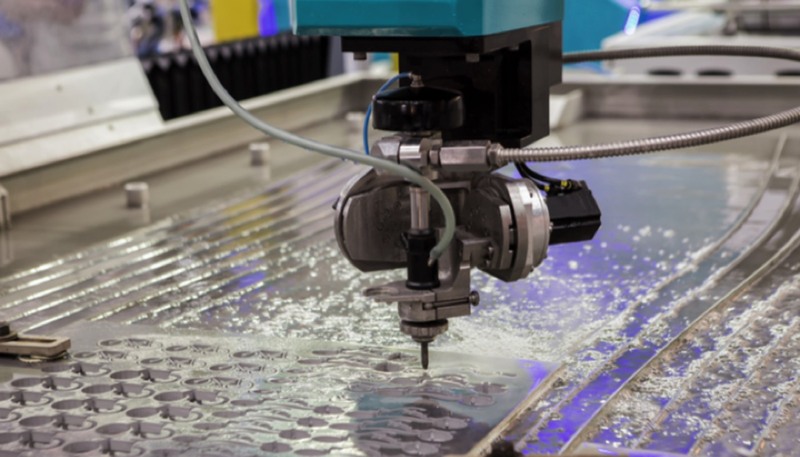 If you are wondering if choosing waterjet cutting for your next project is a good idea, we’ll tell you this: it entirely is! Looking for a Reputable Company with a WaterJet Cutter? Give Us a Ring! Antech Technologiesis the best place to get your materials cut with a waterjet cutter. This ultimate tool for cutting everything from thin to thick materials is a perfect fit for all projects that require the precision of execution and completed within a few minutes. Contact us today for the best deals in the industry! Laser Engraving, Marking, Etching: What's The Difference?